I’ve just returned from the Farmer’s Market with some yummy goodies (hooray for June!) and settled down to pick out some cottons for my sashiko project. I’ve decided to make a summer table cloth out of spare pieces of indigo and white fabrics. Some of these are bolt ends and irregular lengths, some have a lot of spots on them, and all vary as to texture and touch (some are soft, some are slightly crisp). I took a quick shot of a few of them and will be prewashing these and more so I can get started on piecing them together. I plan to use a solid color fabric for backing, maybe even just a simple unbleached muslin. Updates to follow. As for the ebay shop, listings will go up on Friday. I figured it would be sooner, but got involved in redesigning the KimonoMomo website and had to set ebay listings on the back burner for a while. The KimonoMomo site will eventually carry all the items currently listed in my Etsy shop as well as more vintage kimono and accessories. The biggest challenge will be the shopping cart, so I plan to hire a pro to tackle that. Online shopping carts can be such a pain. Previous Post Damp, dreary, and still waiting for spring. Those cottons will look nice together, lots of contrast. 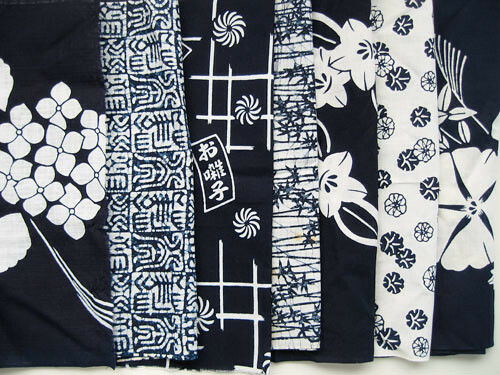 The indigo/white yukata cottons are so pretty, too. I will post as I go along on the sashiko project. I think I really needed something to do for fun, and this will keep me busy for quite a while! Linda, I’d love to see the dye work you’ve done. If you have a link to photos, let me know.